A survey into otter populations in Devon and Cornwall shows there has been a healthy recovery in numbers. A report by the Environment Agency shows 83% of sites visited in the South West where otters have been known to live had signs of otter activity. The recovery is being put down to better conservation efforts, and means the region is now a stronghold for otters in Western Europe. However, many otters are still being killed on the region's roads and the Environment Agency says people cannot now become complacent in keeping otter numbers at a healthy level. By the mid 1950s to 1960s, the UK's once-thriving population had been reduced to remnant populations in the South West, East Anglia, parts of Wales and Scotland. It suffered serious decline throughout Europe in the 1960s, primarily following the widespread use of toxic pesticides. The otter's comeback, as indicated by Environment Agency surveys, is based upon a combination of factors, including enhanced water quality, local improvements in fish stocks and changes in riverbank management. Alastair Driver of the Environment Agency said: "Despite the good news, we can't become complacent. 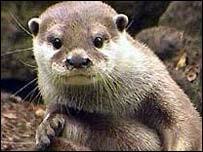 "Otters are not increasing as fast as we would like in some areas." In the South West, otters are still being killed on the roads. About 51 were killed in 2002. Danger areas include the North Devon Link Road and the A396 along the Exe Valley. Alastair Driver, of the Environment Agency said: "We need to concentrate on ways to protect the otter from the motor car - which continues to be one of the biggest threats."